Samford University students, faculty, and staff made pledges to “Get Off the Couch” this year as part of the American Heart Association’s Go Red campaign. Samford’s Dietetic Internship and the Department of Public Health joined forces to remind women of the importance of heart health. Samford faculty, staff and students were encouraged to wear red on Friday, February 5 in celebration of National Wear Red Day®. 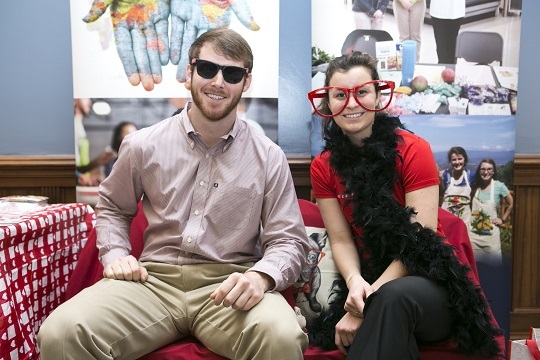 On that day, a red couch was set up as a photo booth in the Samford Cafeteria so that individuals could stop by to pose with props for fun pictures. After having their picture taken, participants signed a pledge to “Get Off the Couch” for heart health. According to Gaines, studies indicate that the more you enjoy a physical activity, the more likely you are to continue to do it. “If you dread the exercise, you are much more likely to talk yourself out of doing it. That’s why it’s important that people find something they enjoy so that they can maintain it,” added Gaines. The Go Red campaign and National Wear Red Day® were created by the American Heart Association to raise awareness of the importance of making positive changes to improve heart health. According to Kim Davey, assistant professor in the Department of Public Health, heart disease and stroke cause 1 in 3 deaths among women each year.